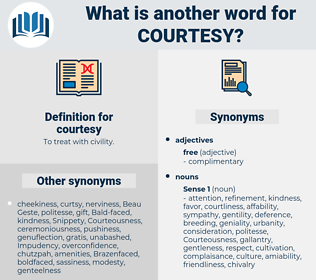 What is another word for courtesy? kindness, friendliness, decency, deference, etiquette. denial, cruelty, harshness, malevolence, unkindness, selfishness. roughness, neglect, rudeness, coldness, unfriendliness, disregard, bad manners, aloofness, meanness, fear, disdain, pompousness, disfavor, ignorance, impoliteness, thoughtlessness, discourtesy, disrespect, Unmannerliness, coolness, crudeness. folly, awkwardness, indecency, incorrectness, Unwisdom, Clownishness, arrogance, informality, fatuity, boorishness, inappropriateness, impediment, ill-breeding, casualness, clumsiness, surliness, stupidity, hurdle, conceit, vulgarity, hindrance, pretentiousness, boldness, shamelessness, interference, improperness, delinquency, obstacle. O'Neil met him with courtesy. As the Queen entered he rose and with grave courtesy offered her his chair, which she did not take. carducci, curtisia, cartouch, charades, courthouse, cigarette case, crataegus, cretaceous, ceratitis, ceratodus, cowardice, carditis, cartouche, cordage, crotch, czaritza, cardiac, charity case, chartaceous, Cesar Ritz, cordaitaceae, cortege, criticise, courteous, chorditis, cordaites, cortes, cortex, carthage, criticize, critic, corditis, cards, curtiss, cortez, cardcase, critique, curtis, crudites, cords, carrot juice, carduus, credits, charity toss, curtsy, card-house, cartage, crutch, curtsey, choriotis, curettage, cardhouse.